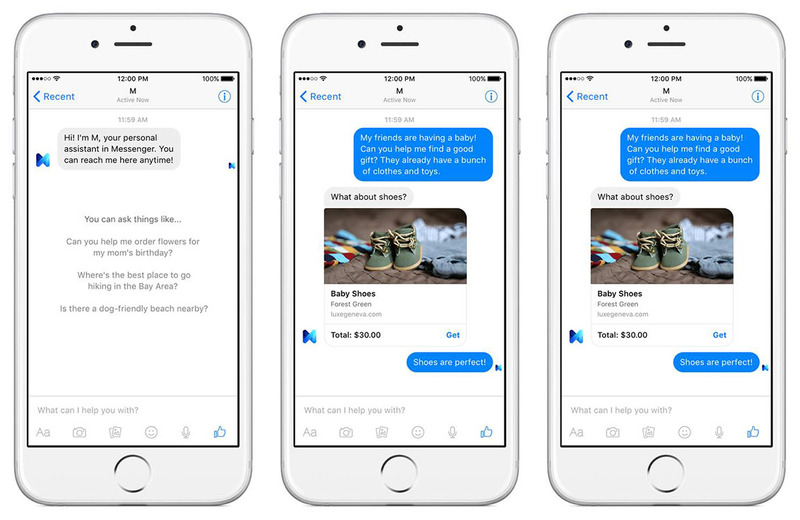 Facebook recently introduced the world to ‘M’, its brand new virtual assistant that will reside in Facebook’s messaging app. Will, because for now, the new application is still in its test phase. Nonetheless, this rather unexpected move of Facebook is interesting to say the least. In contrast to many other virtual assistants, M can actually complete tasks for you, like ordering flowers, making dinner reservations or calling customer service desks. How? Well, there are a couple of significant differences between M and its predecessors. The new application communicates solely via text and, more remarkably, is still co-dependent on humans. Facebook has taken a step back – or maybe one step back, two steps forward – in artificial intelligence and called in actual people to help on this one. A new and different approach to virtual assistance, that’s for sure. But why Facebook’s sudden interest in joining the gang of digital sidekicks? Next to Apple’s Siri, Microsoft’s Cortana, Google’s Google Now and Amazon’s Alexa (which all use, in contrast to M, mere voice recognition algorithms), isn’t the club getting rather crowded? It’s nothing new that social media platforms such as Facebook are monetized through the vast sums of data they accumulate. Data which, as Cruz, Oboler and Welsh (2012, 3) point out, is avidly used by business clients, governments, other users within the social media platform and the platform provider itself. According to the authors, ‘accounts that are frequently updated and used across multiple aspects of a persons life offer the richest data, and possibly also the greatest risk’. No wonder Facebook wants to add to their data by moving into new fields. According to Cruz, Oboler and Welsh (2012, 4) in order for the information to go up in value, a primary key that connects the data with existing information is mandatory. And that’s where Facebook’s billions of user IDs come in handy. And besides this, consumers are using social media more and more frequently to look up information and make their purchase decisions (qtd. in Mangold and Faulds 2009, 5). With M, Facebook has taken its first strategic step to permeate the lucrative realm of web search. Instead of typing your query into the ubiquitous search engine, you now put your request straight into your conversation with M who then does the searching for you. In an interview with WIRED, Marcus even declared it his main goal to make Messenger the first stop for mobile discovery – instead of Google Maps, Siri or even Twitter – subsequently changing the role Facebook has in our lives for good. It goes without saying that Facebook is hoping to make M into a profitable extension of their services. How is pretty obvious: new integrated M-ads, making deals with companies in order for M to ‘keep them in mind’, and all in all just another trick on Facebook’s sleeve to keep you in their moneymaking sphere even longer. One single company that has access to your age, gender, pictures, public (and private) messages, exact location, background and consequently tracks everything you like. That same company is planning to start an additional database containing all of the things you search for, question, or even as much as consider doing. And it might even begin to predict what you will do in the future. So the more you ask, the more M knows, the more Facebook becomes all-knowing. And it’s completely up to them what they’ll do with that. A quote that went viral in the debate around Big Data, first posted in August 2010 by Andrew Lewis (username: blue_beetle) on community weblog Metafilter. Mangold, Glynn and David Faulds. “Social Media: The New Hybrid Element of the Promotion Mix.” Business Horizons. 52. 4 (2009): 357-365. Smith, Matthew, Christian Szongott, Benjamin Henne and Gabriele van Voigt. Big Data Privacy Issues in Public Social Media. International Conference on Digital Ecosystems and Technologies, June 2012, Italy. IEEE: Leibniz University Hannover, 2013.